Harmony Bowels is UNM CCC's latest pharmacist to become Board Certified in Oncology Pharmacy (BCOP). Harmony has a long history with UNM. 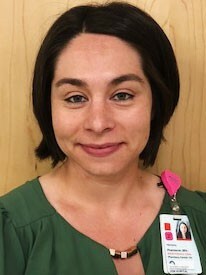 She graduated the UNM Pharmacy School in 2011; afterward she completed a PGY1 residency at the University of New Mexico Hospital. Harmony then went to complete an oncology PGY2 residency at the Huntsman Cancer Center in Salt Lake City Utah. She then went on to practice as an oncology pharmacist at the University of Arizona Cancer Center. Harmony returned to the UNM Comprehensive Cancer Center in June 2016. She currently leads our oral oncology program and specializes in women’s oncology. Congratulate Harmony on her major achievement and all she does for our Cancer Center patients.